Over the years, through many forums, mediums and methods I have been told (and I have known) that I am a lightworker. I have held this truth so tightly in its secret box afraid to believe for fear of either societal pressure or heavy responsibility to follow. Recently, I went through a MAJOR transition and I have finally been in touch with my spirit guide, whom is named Snow. I have been told that there will be more, but for now it is just me and Snow ;) Of course, ever the student, I delved into researching the spiritual meaning of snow and along the way found a new album from a band that I would never have assumed carries the message....the entire album is a spiritual awakening and turns out to be the final "push" I needed to solidify my role and accept my path. Reading Rebecca Campbell's "Light Is The New Black" was a big kicker too. Every single song on this album has beautiful significance, but these two are my favorites of the messages because I danced my heart out for over a week now (whenever I am not tending to life's various responsibilities within this dimension) and instead of feeling burdened by the responsibility I thought would come with accepting my role...I have NEVER FELT MORE FREE!!!!!!!!!!! 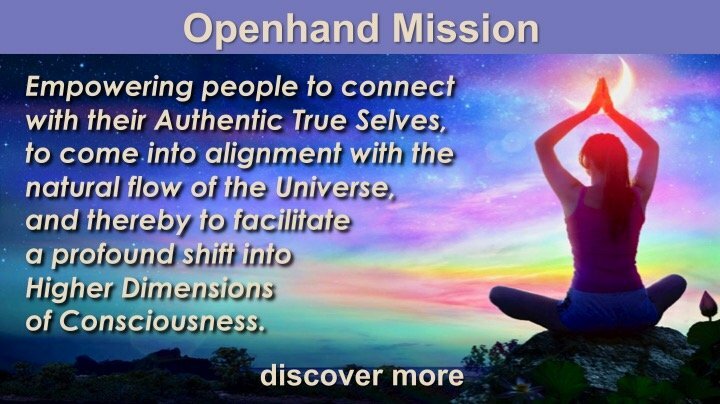 Openhandweb.org was the final gateway that I passed through and I cannot tell you what you all mean to me for being an epic part of this beautiful life and journey that I am so blessed to have!!!!!!! "This light of mine isn't so little..."
Yes, I’m a lightworker too! I don't know if I'm a lightworker or not. But this is synchronistic to an emerging feeling that I have. That is I'm enough just the way I'm right now. My beingness is enough and there is nothing that I need that I don't already have. It's about realiazing ones true power. I'm reading the book sidhartha by Herman Hesse and it offers a reflection for the feeling as well. We are all united by this common thread that we have the true power in our innermost self. Others can offer a reflection yes, but we each hold the key to our self. This liberates me from the search for a teacher, an authority to take away the pain, offer validation for our self doubts which is ultimately not possible at all. So why not start looking into oneself for the answer? Because it's already there! Thank you Vimal and Anastasia! Meanwhile, I will meditate for your wounds Anastasia and will be available to you if you ever need to talk. My email aphroheidigraff@outlook.com welcomes you. Vimal your words are profound and the seeker in your soul is definitely on the right path in the right time and I appreciate your sharing and will meditate for your wellbeingness (you've inspired a new word ;). I wrote this poem after reading your comments (for some reason my GPS giving directions interjected itself, tee hee! My soul yearning and burning for the ride, but afraid to take it. Make a legal U-turn if possible. I am no longer stagnant. I am LOUD. I will not be moved. I will not be muted. Take Exit 111 on the right. I am supported by the Universe, the angels, the source, the light. I no longer feel undeserving of my plight. Third Eye vision, now my sight. No longer only good “despite”. I invest in me. Not careful, not realistic, having no limitations. Unattached to what I heard and cried with powerful lamentations. The light I am here, Chakras in flow, embodying the highest of vibrations. Conscientious for the world and conscious of my breath. I am compassionate for myself now, not just all the rest. There is always plenty and I am always enough. All I know and those I love are in ALL WAYS enough. Love, Light and All the Good Stuff to you! I've been taking some down time and feeling a strong connection to trees. I think the feeling that you describe emerging for you, that of ‘being enough just the way you are, and already having everything you need’ is one of the most significant realisations one can have, even if one is not consciously on the spiritual path. It’s a core feeling that kind of changes the whole ball game, don’t you think? It pretty much challenges the whole 3D system we’re conditioned to nurture. Imagine if everyone came to this understanding, how much of the structure around us would just collapse. The beauty industry would find no foothold, consumption would decrease considerably, and many more people might actually pursue their true passions, instead of just working themselves to soullessness in order to increase GDP. In fact, most crimes would cease altogether. I think you’ll find, as you nurture and pay attention to this feeling of yours, that so many layers of societal conditioning will fall off of their own accord. It’s truly a seed of personal empowerment. I don’t know what the actual definition of being a lightworker is. I only know that after pursuing all kinds of possible ambitions and outcomes in the 3D world, and eventually realising they lead nowhere, I find the only thing that makes any sense is being a lightworker. I can’t find any other possible meaningful reason why I may have chosen to come here. So it has kind of been a process of elimination for me. I also have another thought. Being a lightworker essentially means ‘working for the light’, right? Since we all carry the light inside us, and like you say ‘have the true power in our innermost self’, don’t we all then have the ability to be lightworkers? I think if one is willing to fully commit to walking the path, you eventually run out of all other options except shining and sharing your own light for others to benefit from, which inevitably leads to being a lightworker. At least that’s my own conclusion 😊. Trevor Hall! I have been just loving his music lately.... I find his tunes Immerse me in an internal love affair .... Thanks for sharing! You are absolutely right. It changes the whole game. Coming from beingness may challenge all belief system including those spiritual, right and wrong, expectation of others etc. There is incredible feeling in the knowing that my feelings, my soul is all I have to follow and nothing else. So being me challenges the conditioned behaviours in me as well as others then I might as well be a lightworker. We all are if we are progressively bringing light into ourselves. I see that I have no control over what happens outside of me but only my reaction in relation to those. Everyone has their unique journey and its not my purpose to change it for them. There is also a unique feeling that I'm invited to be something beyond me not by doing something but by being me. It's not to say I don't feel the expectation or the conditioning. I do. But there's also a knowing that I don't have to succumb to them but find my truth and rise above it by expressing them no matter how its perceived in the outer world. Opening up myself in this way without intentionally trying to protect may give more opportunity for growth and draw the right reflection that I need to see. Even if its unpleasant for the ego there's no greater purpose than learning from one's mistakes. Thankyou for your definition of the lightworker. I wholeheartedly resonate with it. Yes, Anastasia! Exactly! We all have the light and we all can share it in any way that we are capable. I completely understand the "process of elimination" theory as many of my friends have only recently accepted the mere idea of being on the planet specifically to work to their highest good and share their light (the light that many don't even recognize in themselves). Over the years I have had many different "titles" given to me by others (Indigo, Star Seed, etc.) and with all of these projections from others I have come to the conclusion that they all fall under the category of Lightworker, so I adapted that title. Recently, however, the awakening process has sped up significantly and the synchronicities have increased as well. I finally accepted my spirit guide Snow and my abilities to share my light have brought me to my current work and I can see how expansive my light can be. I am giving this endeavor my all and I am pleased with my efforts. I look forward to hearing more about your journey as it progresses. So much love and light coming your way!!!!! "This light of mine isn't so little....."
Thank you for your generous support. I read your personal story on another thread and oh my, you’ve certainly been through a lot. It’s amazing work you’ve done with yourself. I’m so glad you didn’t give up. I awakened suddenly, about 3 years ago, after losing an unborn child. Before that I had never even heard the word star seed or lightworker, but when I discovered the concept after googling strange things that were happening to me, it felt like coming home. Like my whole life’s challenges suddenly made sense. You mentioned your guide Snow, and how you ‘finally accepted’ the guidance of this spirit. I’m curious as to what you meant by ‘finally accepting’. What process did you go through? If you want to share I’d love to learn, since we all have such unique and interesting journeys. For me it started with being able to hear and speak to the soul of my dead unborn. There were in fact two souls coming through and I was made aware of a conflict concerning which one of them was supposed to come. Apparently, the ‘wrong’ soul pushed his way through, so the pregnancy had to be terminated. (Crazy stuff, right? 😉). After that, a whole ‘new’ world opened up to me, and a challenging but magical journey began to unfold before me. In case you’re wondering about the conflict between the 2 souls, it was resolved, and one of these souls, the ‘right’ one, is with me now as my 1,5 year old son 😊. I LOVE the song!!!!! Thank you for sharing it 😊 Also, thank you so much for your open sharing and willingness to be vulnerable and grow in the light! Things have been tough for me, but it has made me who I am today and I would not trade one minute. It has been extremely difficult for me to navigate and find the “everything happens for a reason” purpose of not being able to be with my small kiddos for this long a period, but as everything DOES happen for a reason I found that their absence not only made me a stronger person, gave me a voice and helped me to follow the Open (hand) topic inspired “Forgiveness” to my ex for his hand in it, but ALSO gave me the space to create a life with a dream job, a higher purpose and all the tools to make it all happen. Now, when they come back to me in January, I will be confident that my kiddos will see a woman that they want to be like and I will be a woman that I would want them to emulate. Having this, as a parent and person, is the greatest gift the Universe has ever given me and I am filled with the utmost gratitude. I love how you describe the sudden onset of unsought knowledge as “coming home”. That is a perfect way to explain the loving feelings that flood your soul when you realize that your desire to “light up the world” with love, compassion, kindness, justice, etc. (Whatever your particular gifts may be) is REALLY going to happen for you! Over the years, due to various mediums (music being the first) my mind began to seek out things I had never even heard of in my life. I had never heard of “Sacred Geometry” or “Numerology” for example. I suddenly found myself searching the internet, buying books, seeking knowledge about things that I had not even fathomed before. One would lead to another and my mind began expanding to things that seemed “unreal” or “impossible” to me in my life before what I call “The First Call”…even though I was absorbing all of this information and having faith regarding its feasibility, I had no idea how it might apply to my life in general. I began meditating frequently and became a yoga practitioner and then a Doula. Spiritually, I thought I was getting the idea 😉. It wasn’t until very recently, when I had a crisis of faith (over my children being torn from me; much like your intensely challenging situation with your baby souls) and felt completely inauthentic with regards to my practices and my teaching, that I heard Snow speak to me. I had gone to Mt. Shasta (When I had the cancer) and fasted on the mountain for 5 days after a sweat lodge and a walk with a Shaman. I went with a group, but we separated for aloneness once we got to the top where the glacier water flowed freely. We had only the wilderness and that amazing water. I had an extremely beautiful and spiritual experience when these gigantic faces in the sky told me “You already know what to do”. Later in that journey I heard from Snow for the first time who presented himself with actual snowfall in the middle of summer for about 5 minutes. My friends and family all said “you hallucinated because you were fasting, that’s all.” To which I replied “whether or not it was a hallucination, it was positive for me so just let me believe what I wish to believe”. I was healed of the cancer. For years I wondered about what the words meant and whether or not I had hallucinated, even though it felt so real…more real than anything else actually. Years later, with this humongous challenge before me of trying to forgive a man who had harmed me so significantly and then took my children from me with underhanded and devious tactics, I read the Open Hand post about “Forgiveness”. That very day, after I read it, I meditated for hours on forgiving this man and my mantra became “it is his journey to do this evil and create his own sanskaras (karmic debt). It is my journey to grow and become stronger because of this experience”…there is actually no need to “forgive” as it is no longer an issue because we contracted these things before entering this lifetime and it played out exactly as it was supposed to. With that knowledge and that mantra (a word that literally translates to Mind Tool) I let go of every ounce of fear, anger, anxiety, etc. and gave my soul over completely to the light. Within minutes of ending my mediation I heard Snow again, he came with the harmonics that I had heard hundreds of times and ignored thinking I was “crazy” because no one else ever heard them. This time I listened. Not only did I listen, but I heard and validated. I had read a book that told me I had spirit guides and all I had to do was name them and ask for them to appear, which is what I did in my meditation. The book “Light is the New Black” and the album, from a band my friends always told me I should check out, especially since “Snow” is my spirit guide, called Snow Patrol. On this very thread Open posted a song called “Life on Earth” and I have had it on repeat ever since I heard it. Recently, I looked online to see if they might tour sometime soon and found that a concert was here in Seattle literally two days away. I found that the tickets were sold out and not affordable anyway. It was then that a new post came up and I saw that they were giving a free acoustic performance in a record store the night before their show (the next night after I saw the post). I went, had an amazing experience, met them and realized that when I ask Snow to present opportunities in my life, they are presented. So many wonderful and joyful things have happened to me since. I have released my attachment to so many things and welcomed source. I am sharing my light freely and living life joyfully. I dance, do yoga and meditate every single day and revel in how it delights me. I love my job because it allows me to give a helping hand to thousands of people and I am also serving my life’s purpose of being a Doula and helping mothers and new life on the planet to flourish with my support. I am loving life Anastasia! Now is the time for you to do that as well. Do not let human construct veil your light. Shine it, live it, love it and watch it grow! I am here for you and will hold your light in my meditations in hopes of helping raise your vibration and glow…you’ve got this. Since it is a music thread, I am sharing a video I took at the record store show. They do an amazing version of Chris Isaak’s Wicked Game…the vocals are hauntingly beautiful and bring me so much joy! Thank you for the "Nature by Numbers" video; I love it! I hope that this song brings you the intensely triumphant joy that it gives me whenever I hear it. "This light of mine is not so little"
I am posting this video for a couple of reasons. First, the sharing that everyone has been doing to support one another is so beautiful and it reminded me of this song. It is my way of saying "as brothers [and sisters] we will stand and hold your hand...you are not alone in this." Second, because I sang this song to my son (when he was in my belly and I did not know who, or what gender, he would be in this world, but I wanted him to have a knowing of the love and support he would always receive from me). I was the stage manager for a play last year and a gentlemen sang this as his audition piece and sang the last line so mournfully that it made me, for the first time, feel a sadness (negative thought) about the song. Prior to his signing it I saw the last line "I cannot move the mountains for you" as a statement of "you have your journey and I cannot interfere"...I wanted my son to be supported, yet have his own beautiful life (which is how I raise him now). After the auditions were over I asked him if he would mind my asking what the song meant to him (I always find it beautiful when a song is interpreted differently with each person and their experience, and even the same person with new experience). He told me of his brother whom had died of a drug overdoes and he felt such a profound sadness that he was unable to "move the mountains" to save him. It was then that I knew why the Universe connected us. I told him, as gently as possible, you supported him and loved him (and you still do), but it was not your mountain to move. We talked for a couple of hours after that and we are very good friends now. I have had so many people give me support in the way that the Universe gave him support through me and I just wanted to share this beautiful song to remind us all that we move our own mountains, but with the loving support of those around us...I am holding all of your hands in love and light! Hey everyone, this is such an expanding song!! I reheard this version on my way back from the Himalayas. I had the Ganges flowing on one side and the sheer enormity and gorgeousness of the post monsoon Himalayas on the other . It was such a wonderful time ! I hope you guys like it . The words roughly translated say ' My lover is back home ' . And really that's so beautiful isn't it ? I have recently discovered the beautiful music of Greg Laswell! Today this song, particularly the sentence 'the world is not listening' caught my attention, just thought to share it here. Check his music out! Thank you so much for your post Marye (beautiful name too ;)! I have not yet discovered Greg Laswell and it is always nice to hear something so beautiful...In addition, I need to feed my musical modality for pure release and the beingness that it provides. Open, I am also so happy that you posted the Mumford and Son's song with the full orchestra! Zowie! I have loved their music for a long time and sang the song "Timshel" to my son every day that he was in my belly ;) I loved the words "death is at your doorstep and it may steal your innocence, but it will never steal your substance" and especially loved "you are the mother of your baby child, the one to whom you give life and you have your choices and these are what make man great, his ladder to the stars." I wanted to say that one of the songs that made me realize that meditation is not all about silence and is often about zoning in on music and really being present with what it means for you in that moment. A song by Floater has the line "Thanks to the crowd and their singing out loud, I can finally not hear myself thinking". They have a multitude of fabulous songs with wise/clever words that have deep and ever-changing meanings for me...that line made me ponder the fact that I seek out the dissonance/hullabaloo of live music and passionately embrace the emotions that it evokes and use them to self-actualize. I have done my workshop a few times now called the Audio "Vision" Board and it is becoming a cathartic way for those I serve (those with mental illness/homeless and the justice involved) to use music to self-actualize, much like a Vision Board does for those with more sight oriented thoughts. When I saw the video that Marye posted, it made me think of how a person experiences music when they see the words with it (as a poetry form combining with the audio) and how one experiences a song more fully (in an auditory manner) when a full orchestra is played along with the words emerging from the artists' mouth...both were profoundly impactful and beautiful, yet different. Endless Part II: https://youtu.be/3xQv_yLrDEg is the link to the YouTube Video..."All these lives that make no sense, all alone we cry in our defense...all of us go down slow, then we rise again..."
2. Come back to your comment on Openhandweb, then click the little chevron with the dash under it, in the grey bar at the top of the comment form. It's the last icon to the far right. 3. Now you have the code behind your comment posting. You can simply paste the video embed code there. 4. When you click the chevron again, you go back to how your comment now looks, but with the video embedded. I trust it makes sense! Youtube just dropped this beautiful song at my doorstep and I thought to share it with you here! What a beautiful song - deeply touching - thanks for sharing. I can see it featuring in the Openhand gatherings. Another great one from Nahko Bear, particularly if you pay attention to the lyrics! It would seem like a change of gear for Nahko - speaking louder, more extreme. I'd say it's entirely necessary - too many people sitting back, not really stepping up to the plate. I wonder what will it take? You know how sometimes you hear a song and just can't get it out of your head? !